Ratchet up with these steampunk-esque Gizmo glasses. Complete with wood grain finish on the temples and rivets on the front, these glasses look like they are straight from a mad scientist's lab. 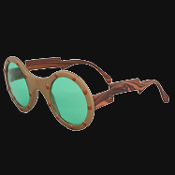 Wood grain finish on the temples, rivets on the front, like a scientist from the Victorian era. Steam punkesque!